Bring back the old one. Miss the old weather page! Why does the winds, inside this app, say 100%? What does that mean? Shouldn’t it give the wind speed? That is what most people would look for, the wind speed. 100% winds means nothing. I hate the new app. The scrolling features are annoying. What happened to the Traffic updates? Great app but lately every time I open a video on the app it crash the app and goes to the home screen. Also have tried it on another device and same problem. I use this APP throughout the day but I don’t enjoy using this updated version as much as the previous one. I preferred smaller subject material to quickly view and then read what I was interested in. I just wanted news. Instead videos and very few news articles. You have to search to find more than about 5 articles. What happened to the traffic icon on this app?? I used this app for checking traffic in/around Houston and it seems to have disappeared from this new version. The new app is not user friendly. It doesn’t give a overall view of what abc 13 has going on or reporting. 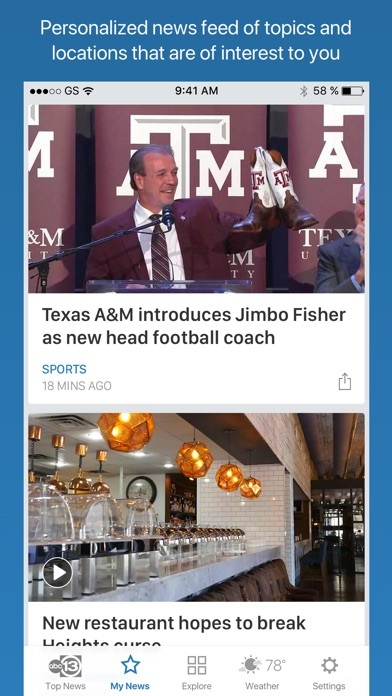 You have to stroll through the app and see stories one by one. The app is not set up closer to what the website looks like. App now crashes every time while trying to open after the latest iOS update. Can’t find Live newscast. Like to watch the news, traffic and weather at the 5am. 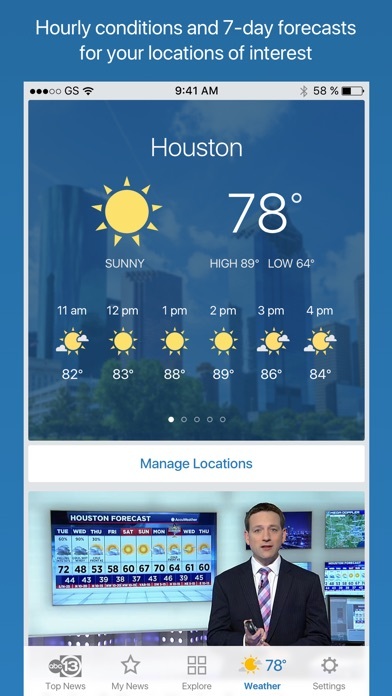 Why the need to select “My News” when the need is to hear about the entire viewing and listening area of Houston. I agree with one of the comments, it’s not the same. I have a problem connecting this app to the internet. The app is all chopped up. I don't like the way the new app is set up. It doesn't refresh to latest news, I have to scroll down to see the news. Go Back To Previous Version! Pros - The new design is nice. Cons - Stories never get updated info, even if it says it’s been updated. The traffic section is either extremely well hidden or non-existent. It used to be easy to find. Not user friendly. Can’t find traffic map anymore. Deleting app. No need for it if it takes forever to find what I need. This was my favorite app for local news and weather until you reformatted it. Now it is so difficult to find anything. Will be looking at another local channel app from now on. I need ONE app that gives me the information I need quickly and easily. The app seems difficult and very different to use than the last app. I get a feeling that I have to navigate the site to find what im looking for. The biggest problem is finding the 7day weather forecast. What a bummer. Agreed it was better before. The only thing I like better is that video’s pictures doesn’t have the play button covering the middle of it before you play it & It is cleaner looking, larger, and clearer to view which is nice but the pervious version was organized better and had a better layout. Also I’m not sure but I think I have to register now to view it which is horrible. I can’t view it it says it needs to connect. So idk? The first video you view everyday shouldn’t have a ad for it. FYI it makes ppl not want to watch videos if they only see one thing worth watching. But the info should be all written below it. Also I got to say Travis herzog this Monday total got the weeks forecast wrong and was the only weather report that that said what he said. “Pacific cold front?” It’s the coldest week I’ve seen ever for houston. You said no concern for freeze?!?! I know the weather changes but you won weather man of the year. Step up to David Tillman’s level! ;) where’s Casey also? But I like your delivery Travis. But your lucky cheta got married or I would watch her still. She also got the closer prediction by a mile. Maybe next time you miss the weather by this much you can help me cover all the plants at my job. Because I thought I was good but it’s colder now than I’ve ever felt here. Not a fan of the new app. I prefer to see a list of news stories and choose what I want to view. The new app doesn’t work on my iPad - it always says no internet connection which is not right as I can watch the live stream portion just fine. As of this writing, when I click on the App I get a message that I am not connected to the internet. Obviously my iPad Pro is connected, or I would not be uploading this review. 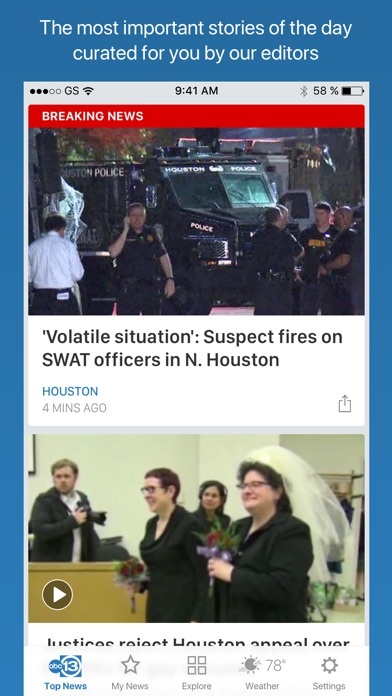 I like this App and used it daily for local Houston news. Fix it please. When I click on the app it tells me "no connection". My wifi is on but I still can't get access. This has been going on all week. Fix it !!!!! Other news stations available that do work. What's up ch 13??????? It is very hard for me to use now. I used to use it religiously when a weather event was coming in, but is too hard to bother with now. AWFULL. Like the old format way better. If you keep asking for feedback you must be having problems. Why would you change your format! This new app is absolutely horrible. Thinking of going to 11 News now! AWFULL AWFULL!! This is a terrible new app. Th old was much better. Will be deleting this new one. Not enjoying the new APP layout. The visual changes makes content easy to read but the layout leaves something to be desired. Means of navigating content needs improvement. I don’t like having my news selected for me. I want to see the headlines and choose for myself. I agree with bBarnes58 review. Lousy update to what was a great app!! 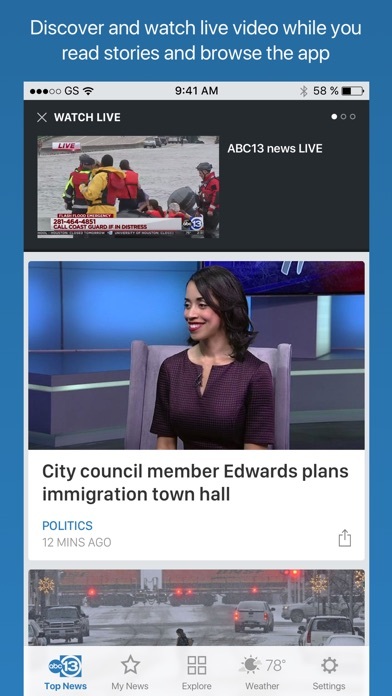 New app extremely frustrating to try to find news, etc. that u r looking for!